Business has never been better for Virospack. After 60 years at the top of its game, the Spanish company is expanding to ensure that it maintains its place leading the world’s cosmetic dropper market. Webpackaging talks to Rosa Porras, marketing-communication manager, to find out what’s happening right now, and how the company has consolidated its position with the world’s top international beauty and cosmetic brands. Virospack is 60 this year; can you tell us about the company’s history? 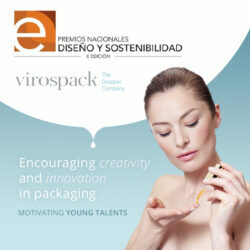 That is correct; this year is the 60th anniversary since Virospack was established. It was back in 1956 when the company was set up as a family business and it is still a family business to this very day. From the outset, the objective of Virospack has been high quality production with strict Q&A controls. A primary forte of the company is that everything is and always has been produced under one roof, controlling each component and process step for quality assurance. Even though the company’s place in the market has changed, Virospack has always commanded its reputation at the forefront of the dropper industry. Initially Virospack was involved with the formulation of rubber for pharmaceutical purposes. However, this quickly developed into the specialization of producing rubber bulbs, droppers and stoppers for the pharmaceutical sector. In the 1970s other materials such as urea and plastics were introduced into the packaging mix, followed by tubular glass and decoration. It was the 1980s when Virospack really changed tack from the pharma to the cosmetic market and also made its name on the international business front, setting the pace for what the company is today. Now we are at the cutting edge of rubber technology. There are no companies that know how to work rubber for droppers like we do, and even less that produce the full dropper. That is why we have consolidated our name internationally as “The Dropper Company”. Even at the forefront, we’re looking to the future, investing, innovating and growing, answering new market needs and trendsetting. How is Virospack looking to the future? Our factory is situated in Barcelona, Spain, and four years ago we started working on an expansion. We’ve already opened new offices and facilities and our modern new factory will be inaugurated next year. Phase one was when we increased floor space in 2012 from 4,000m2 to more than 11,000m2 and we renewed our machinery and moulds. Phase two, to be finalized in 2017, will see further expansion. This is in response to increased demand and also because of the company’s commitment to protecting the environment as much as it can. The new office space is both more comfortable to work in and is more eco-friendly than previously. The new machinery that we are investing in will also have a lower environmental impact in addition to improved cost efficiency and higher flexibility. The final investment by Virospack for the expansion and new equipment will be around 5 million euros and the new machinery that is coming into play will include special rubber cutting, injection and refrigeration machines, automatic assembly lines and special, new decoration equipment. We’ve been working on some incredible new decoration techniques. First, the metallization of rubber bulbs, a luxury finish desired by brands for years and achieved by Virospack without losing the excellent elasticity of the rubber. Second is our customization of pipettes with silk screening. Both techniques were launched this spring. We have many more innovations and ideas, recently presented or in development, such as bulbs injected with textured microreliefs in different designs (natural, lacquered and also metalized) or mouded glass bottles with iridescent inks or containing glitter, or soft touch finishing. All this in addition to a new automatic metallization line (which will triple our efficiency), hot stamping capabilities, and a UV oven will provide us with so many more opportunities to meet and surpass our customers’ needs and desires. All brands look to create a piece of aspirational packaging with a qualitative image that transmits the brand’s concept and values, and all of them look for differentiation, so decoration, especially within the cosmetic market, is of the utmost importance which is why at Virospack our R&D team along with our technical department are working so hard to develop new finishes and decoration processes. At our facility we already offer a big range of in house decoration processes like lacquering, hot stamping, screen printing, wooden finishes, metal shells, aluminium sleeves, metallization and more. 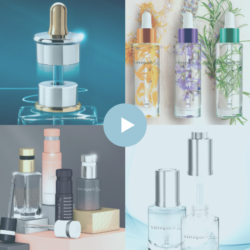 Although Virospack is a dropper production factory, we are aware we are players in the beauty industry and therefore we are 100% oriented to design and image innovation. The packaging is the first card product presentation and the look of it is really important to consumers. An image which, of course, must be accompanied by package and formula compatibility, ensuring maximum precision and safety in dispensing it. Our designers, engineers and our strict Q&A department know it and work in this way. In this sense, many of our innovations are technical and with the end-user in mind. For example, droppers that include wipers or drop catchers. Are you involved in new product development? Yes, I am, absolutely. One of my responsibilities in the company is to gather knowledge of the beauty and fashion market, to know what brands are looking for, to know what new trends will be. I work in marketing, so my involvement in new product development at Virospack is from the perspective of the market, brands, and consumers. I don´t have any technical knowledge but I have been working for more than 20 years with cosmetic products, with brands, and talking directly to the consumer. Now I am on the other side of the channel, thinking about how to create new needs. I have to understand what it is that the beauty industry is looking for and help the company stay one step ahead. It´s not difficult at Virospack, we are lucky in that the technical department is incredibly strong and the R&D team is already quite creative. What is your typical day at Virospack? I don’t have a typical day! I don’t even have a typical week as I’m involved in so many different projects! Virospack is a consolidated company, leader in its sector, but eager to do new things, to improve processes, to increase visibility. I have the opportunity to participate in many different tasks. My responsibility is communication and marketing and I work internally within the company and externally with our customers and potential new customers, always through Virospack´s sale accounts, and professional media, in this sense. There is so much that happens at Virospack and we’ve done so much fantastic work with so many great companies. Over our 60 years of experience there have been lots of developments and successful global launches that have used Virospack’s droppers. Many well known brands have believed in our standards or have developed specific designs with us for their flagship products. People recognize the droppers straight away, but they don’t necessarily know that we were the company behind them, so I’m working to rectify that. I generate interesting content and press news for the sector, looking for to have coverage on- and offline, also on social networks. I care about the image of the company working with the web and the design of our visuals and advertising. I analyze the market and opportunities in different countries, continents, or beauty segments. I organize events like the special 60th anniversary party that we had in New York last May. I value different collaboration proposals and of course our participation at various shows and congresses and manage the details and staging of the events we attend as exhibitors. Professional fairs are really important for us, as well as attending events, they also provide an opportunity for market research with brands and to see what else the market offers. Droppers are a current trend and this is the first year that other companies have been presenting droppers at exhibitions too, however, whilst other companies have been presenting droppers, we’ve been showing off our decoration capability. Even with a standard piece you can play with the different pieces and get a really nice unique looking finished product. This is the real current trend right now. We have many standard pieces. There’s so much in our catalogue, but because we do so much decoration as client’s like to personalize items, they don’t look the same. We can also develop products according to client requirements. At Virospack we do everything to the max – moulds, customer service, decoration… Therefore we can offer the full package to a client. Do you have a warehouse, or do client’s custom order? Everything at Virospack is custom made to order. We don’t store any stock, components, or final product. Our MPQs are based on production run minimums because every dropper is personalized in one way or another, whether dimensionally or through decoration. The quality level is very high so that is why we worked for many years with the most exclusive premium brands in the world. They expect the best and we can deliver that. We are also able to offer our clients the full pack. Working with partners and with this objective, we have developed two models of moulded glass bottle. We know that the glass dropper bottle is the perfect package for cosmetic brands which produce delicate formulas as it is the perfect applicator for liquid and fluid solutions so we now have a 30ml bottle, a 30ml wide version, and a new 15ml slim bottle. Both formats are high quality and heavy in weight due to the thick glass bottom of the bottle. The wide version has a ‘last drop’ finish that allows for a product restitution of under 0.4% of the product which much lower than the norm. Both models are compatible with a broad range of droppers — classic and push-button, in a 20/410 neck thread and are also available with a wiper. What does the future hold for Virospack? The future is an exciting place for Virospack. We know that we make great droppers and that is our core business so we will continue to develop and innovate there. We see ourselves amplifying our opportunities by offering innovations, improvements, new designs, trendsetting, and certainly making a lot more noise about everything that we can do. We are lucky that we have such a great reputation and that our customers trust us so much. We’re already at the cutting edge of the dropper industry, and customers love what we are doing — droppers are a trend that is here to stay!